The Memorial Forest Shrine at Mohican-Memorial State Forest received upgraded lighting and care as result of discussions and an agreement between the Ohio Department of Youth Services, the Ohio Federation of Women's Clubs and the Ohio Department of Natural Resources (ODNR). ODNR's recent agreement with the nearby Mohican Juvenile Correctional Facility now provides for expanded maintenance and access at the facility. In addition to opening and closing the Shrine daily, youth from the facility will ensure the proper display of the American and Ohio flags and provide daily maintenance at the 32-foot by 24-foot sandstone structure. Over the years, state foresters have planted more than 310,000 trees in the area-living memorials to the nearly 20,000 war dead honored within the Shrine. Members of the Ohio Federation of Women's Clubs from throughout the state were instrumental in raising the money to build the Shrine, which was dedicated on April 27, 1947. The Shrine was constructed as a memorial to the men and women who lost their lives in service to their country. Inside the Shrine are two books inscribed with the names of Ohio's four most recent conflicts. On the last Sunday in September each year, the Ohio Gold Star Mothers sponsor a pilgrimage to the Shrine and hold a special program there. OFWC has helped to maintain the Shrine with contributions from member clubs and individuals. Donations are kept in a restricted fund, designated specifically for the Shrine. 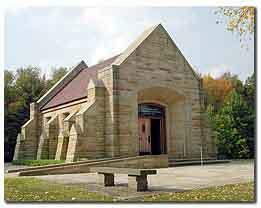 To make a donation to support the shrine, make your check payableto GFWC/Ohio Federation of Women's Clubs. Please indicate on your check that the donation is for the Ohio Memorial Forest Shrine.